As a busy mom of four, who works at home and sends her kids to public school, I find the beginning of summer to be both exciting and daunting. I want my children to have a summer that’s full of special memories, allowing them ample time to explore their creativity and to wake up each day ready to discover what adventures await them. I wish I could say that technique worked for my family. After a few years of attempting to be the fun, spontaneous Mom who practically rained summer-shaped confetti wherever she went, I had an epiphany. An impromptu type of summer sounded like a good time, but it wasn’t paving a path to the joyful season in the sun that I dreamt it would. My imaginings of carefree days faded into a reality check of whiny, frustrated kids who didn’t know what to expect on any given day. The lack of routine wasn’t creating memories — it was creating stress and irritability. My kids weren’t having fun and I wasn’t the mom I wanted to be. I was sowing the wind of a dream that was unfruitful and unrealistic for our family. Three of my four kids are adopted from hard places, and although they’d never ask for or admit it, they crave structure and continuity. All four children thrive on a consistent schedule. I wasn’t offering them the structure they needed, and we were all snapping at each other. I found myself losing patience easily when my expectations didn’t meet reality, and my children spent their days worn out from not knowing what to expect. We were high on spontaneity, all right. We had spontaneous drama, spontaneous tears and spontaneous realizations that important things had been forgotten — and that was just the spontaneity on my end! Things were not going as I had envisioned them in my mind. Our carefree days were not producing the Fruit of the Spirit within our family relationships, so I began the hard work of digging at the roots of what was being planted. I was sowing disorder and reaping chaos. I knew things needed to change so I prayed that the Lord would give me the wisdom to faithfully parent my kids through their summer vacation. I was sowing disorder and reaping chaos. I knew things needed to change so I prayed that the Lord would give me the wisdom to faithfully parent my kids through their summer vacation. Based on the scriptures, I knew that I needed to approach our summers together differently. We would have far more opportunities for making great memories and experiencing joy if all of us were prepared for what was coming next. I determined that I could sow fun into my children’s summer with good planning and preparation. I could still offer them great adventures while keeping an intentional eye toward avoiding overwhelm, keeping things tidy around the house, and spending time together. 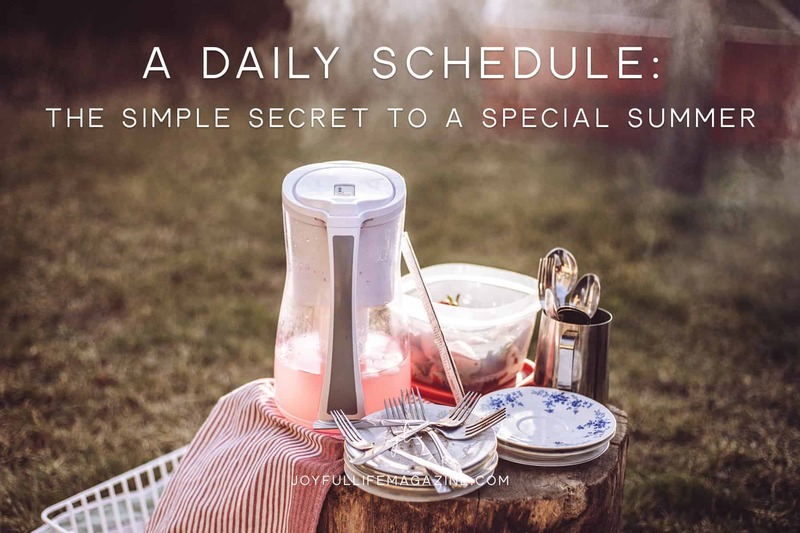 I began to plan a summer schedule that I hoped would reap a harvest of summer fun. I made a short list of the things my children needed to accomplish in the mornings to maintain a healthy rhythm. We are now finding the joy in what I like to call ‘focused fun’. They receive screen time, outings in the afternoons to the neighbor’s pool, or a visit to the $1 kids’ movie in exchange for working through their routines. The routines aren’t meant to be overwhelming — they include manageable tasks such as reading aloud for 20 minutes, making or building something, and an age-appropriate chore around the house. These schedule changes have brought about many blessings. Most notably, we are seeing so much more evidence of the Fruit of the Spirit cultivated in our home. Has it given us more peace? Absolutely! I can also see the relief on their faces as every day starts with the same rhythm. I’m relieved too. I don’t have to be the ‘Poster Mom for Summer’. I can just be a mom who wants her children to learn things and have a lot of fun in the process. Our spontaneous summer moments are no longer, for the most part. But most of the joy that I thought we would receive from sowing the wind in the summer existed only in my mind. I had dreamt of all the fun we would have, but it rarely turned out that way. After I began sowing what I thought was mundane predictability, I was truly surprised by the harvest of sweet summer memories that were made even in the midst of a daily routine. After I began sowing what I thought was mundane predictability, I was truly surprised by the harvest of sweet summer memories that were made even in the midst of a daily routine. Lauren Alexander is a pastor's wife and a mom to four funny and spirited kids. She is the host of the All The Things show which airs live on Facebook and she enjoys writing, speaking, and connecting with her #AllTheThingsCommunity online. You can read more from Lauren on her blog at All Things Lauren or follow her on Instagram. I can remember wanting to be the ‘poster mom’ when my children were young. I could certainly relate to your story. My children are grown now; I recall that focused fun, as you name it, was a much better way to experience a great summer. A little bit of boredom seem to infuse greater creativity too. What a great blog post you have written! Loved this! Thank you for reading, Margie! It is so good to hear that other moms who are ahead of me feel that same pressure and so encouraging to know you were able to overcome! It gives me hope to keep trucking this summer. You are a blessing. Such a great post, Lauren. Even though my kids are grown now, I gleaned ideas for when my grand kids come to visit. Thank you for reading, Terry! I hope you enjoy a ton of ‘focused fun’ with your grandkids! Great article Lauren – thank you for sharing! I love this! I have four little ones myself and having a routine they can depend on is so important! I love this! What works for one family may not work for mine. My kids also need routine, my youngest in particular, and they both need specific tasks to keep them off of screens all day. We have a “Summer List,” which I downloaded but I don’t remember where from. They have to make their bed, get dressed, brush hair, brush teeth, read for 20 minutes, write or color for 20 minutes, help someone around the house, and clean either their room for 20 minutes or 2 small surfaces in the house (night tables, end tables, their side of the kitchen table, etc.). They can get ten get on screens when everything on their list is finished.